For the price of a runecasting session from Witchy Words and how to order, scroll to the bottom. By ordering, you are agreeing with the terms provided in this article. While I enjoy other forms of divination, such as Tarot and the pendulum, my go-to medium of choice is Elder Futhark runecasting. After offering a few free sessions this afternoon, I think I'd like to make this as a permanent service. In order to do that, I should first talk about how I cast runes and how to interpret my readings. This would be a great primer on my method, called rune throwing, if you would like to do that yourself. I will not be going over the meaning of runes in this article. There are a multitude of books and websites about what the runes mean and how to interpret them. And frankly, my method of interpretation is personalized. What the runes mean for me when I cast may not be what they mean for you when you cast. I will, however, go over my runes, where I cast them, how I cast them and how to interpret my rune readings when I post them! My runes are handmade from an oak branch. This type of wood resonates most with me because my maiden name, and thus my last name at birth, was Eiken. Eiken, in German, means "Oak Tree." Oak is a sturdy, stable, down-to-earth type of wood, which matches my personality well. My runes were hand sawed and hand carved on a full moon. As I carved each rune, I meditated the meaning of them, empowering them for use. After I carved them, I painted them with a mixture of cadmium red paint and my own blood. This tied me to my runes and them to me. To dry the paint, I whispered the name and meaning of each rune. Finally, I sealed them with a mixture of various oils and lemon juice. Prior to 2011, I used a rune set I purchased online made of clay. In 2011, I created a wax rune set personally. In 2012, I made this set to replace them. In the two years I have worked with them, no one but me has ever touched my runes. I treat them gently and with respect. They are the most personal tool I own and I take great pride in them. While it is customary for runecasters to read on a white or red cloth, I prefer casting in natural elements. I do have a designated cloth for indoor reading but, when I can, I go outside and cast directly on the ground. My favorite natural place to cast is on wood. At my old rental house, we had a stump that was perfect for this. In the new rental house, I now cast on our deck. This gives me the opportunity to directly write onto the deck what each casting area means. Many runecasters draw their runes in a certain order, akin to Tarot reading. While this method is in now way wrong, I prefer an alternative method known as "throwing runes." Developed mostly for staves, it works for tile runes as well. I begin each session by adding a piece of quartz to my bag and shaking it gently to clean the runes of any potential negativity or previous casting. I then remove the quartz and place it onto the casting area to help strengthen my reading. Using my dominant hand, I reach into the bag and mix the runes while meditating greatly on the question in mind. I may also use someone's name or a word they find special enough that it may connect me with them. Once I feel compelled, I grab a handful of my runes and gently toss them onto the reading area. I remove any runes that are face down. For me, they have no meaning. I also pay no mind to the direction of the runes as I do not believe in merkstave or inverted runes. 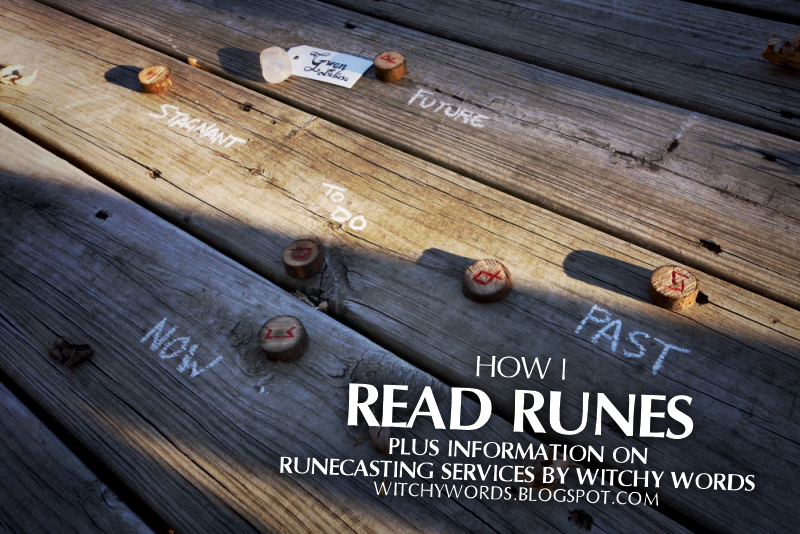 Where the runes land face-up on my casting area determines the result of the reading. Runes that land on my right signify the past that has led up to your question. 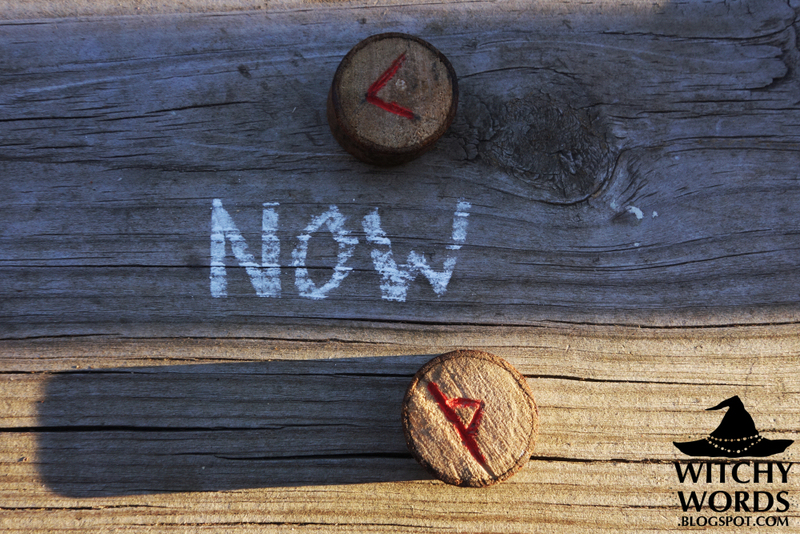 Runes that land directly in front of me symbolize your current situation. 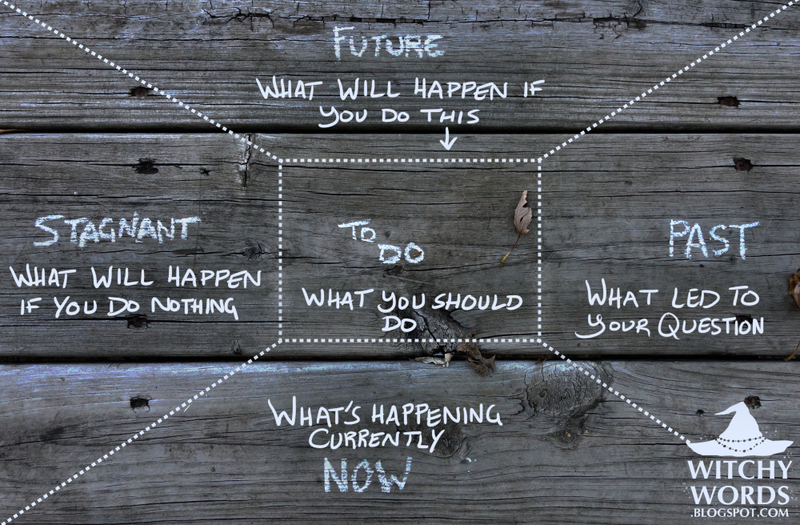 Any runes in the very middle are the steps you need to take to achieve your goal. 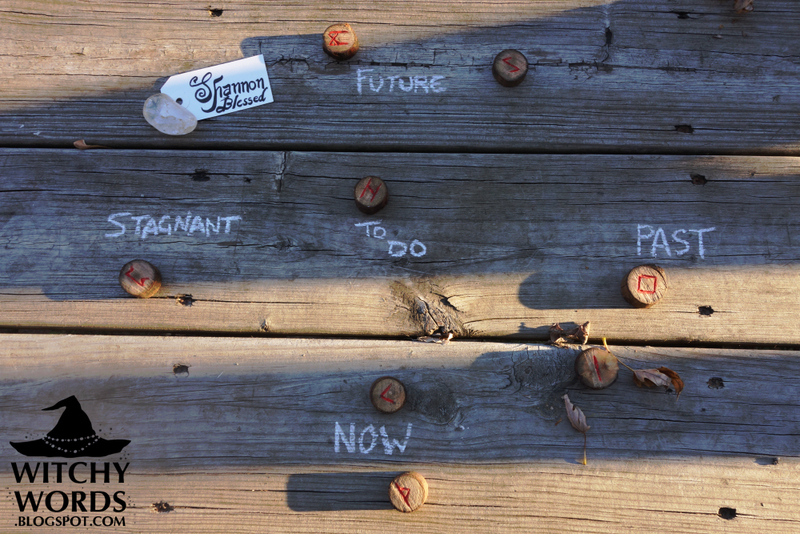 The runes that land the farthest from me is the future if you take the proper steps. 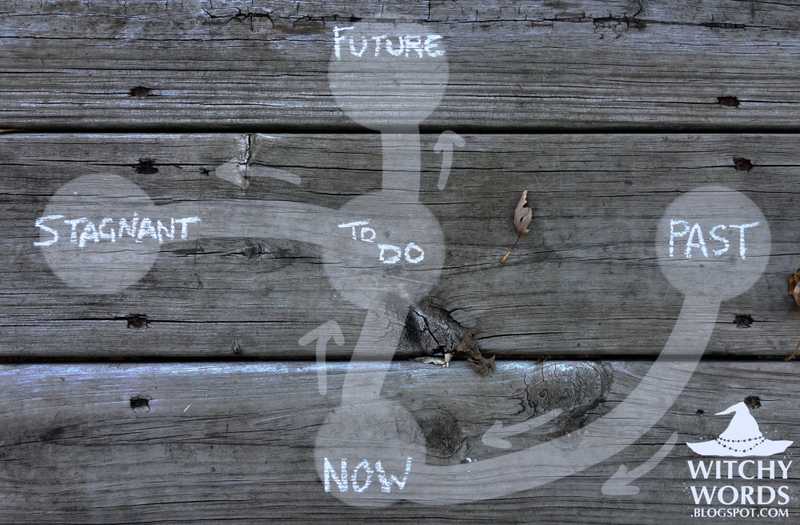 Finally, the runes on my left signify what will happen if you do absolutely nothing. I believe my runecasting area is very fluid. 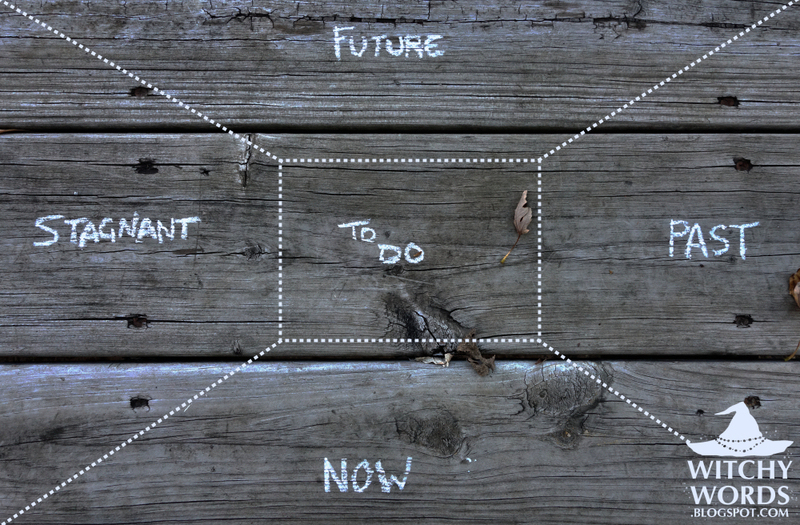 There are no solid lines or direct cut-offs as to what lands in the past versus now, or now to the futures. Instead, the things that are farther right are things that happened further in the past. Things that are closer to the future are things that should happen further in the future. Like time, the area is continuous and moving. My runecasting package will include eight separate pictures, one collage and a description of your reading. The first picture will be an overview of my runecasting to your question. This includes a full view of my casting area along with a piece of quartz and a specialized tag in the generalized future area. The tags are handwritten and charged with your question in mind. 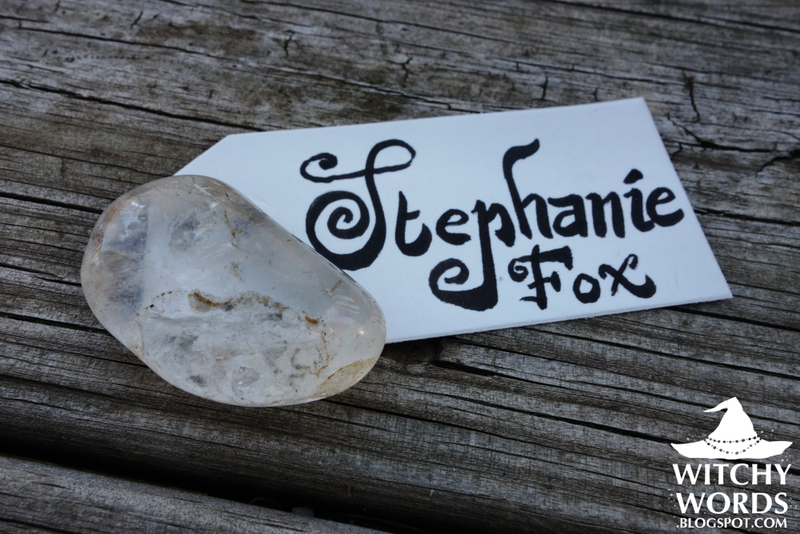 The quartz enforces your question and projects it into the reading. 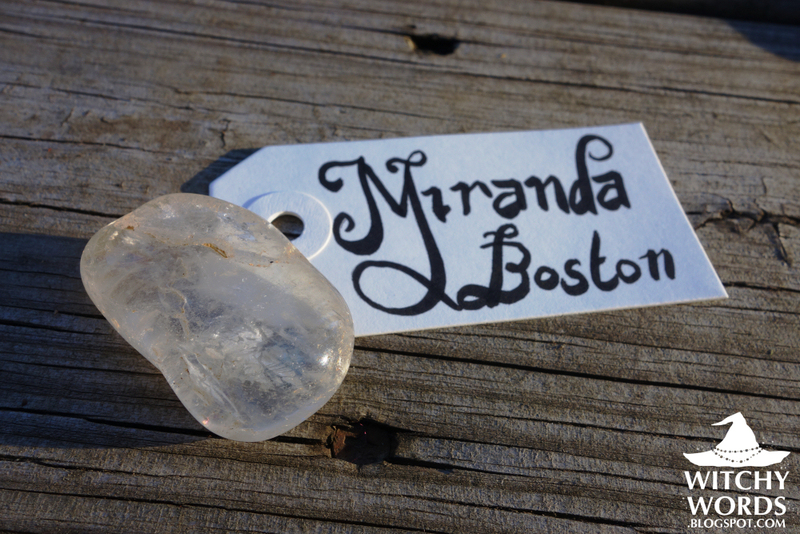 You will receive a close-up photograph of your tag and the quartz. The next five images will be closer views of each section of the casting area along with a description of the runes involved and how I am interpreting them. If any of the interpretations are confusing, please ask for clarification! You are allowed one free clarifying rune draw. I will not be able to take a photograph of it, but I will let you know what I drew and how I think it may alter or enforce the meaning of the rune you are clarifying. 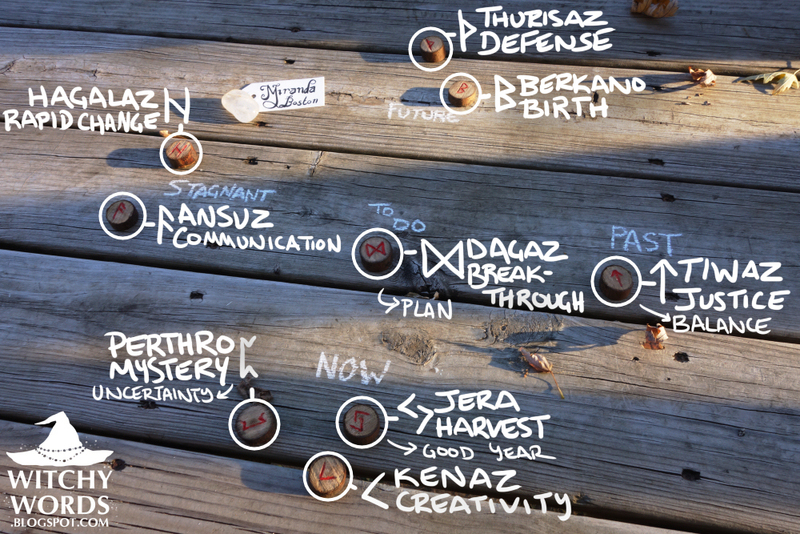 The last photograph in your rune reading package will be a visual explanation of the casting area. This complete diagram will offer you a summary of the reading I've provided. The final picture you will receive is a collage that combines all of the seven photos without writing into a small, neat package. Both runecasting sessions are missing the collage, but it will be included in yours! My apologies but I no longer offer rune casting services. Nonetheless, I hope this article is informative and useful for you! Thank you so much! Very neat idea! Good luck in this new endeavor. I made my ruins from stones I collected from the Great Lakes this past summer. I didn't use my own blood, but that is a good idea if I ever feel the need to make another set. That sounds amazing! Blood isn't necessary for rune-making, but it's something I wanted to do to personalize and connect with them better. My first rune set did not include blood - I mixed saliva with the paint instead. Because I'm terrified of needles, pricking my finger for the blood wasn't an option then but it has become one more recently as I'm slowly getting over said fear. Thank you so much! Try menstrual blood, dear. There is no more powerful blood than this! This is really cool, I am currently studying the runes and don't feel ready to do a reading yet, but when I do, I like the idea of casting on the ground or on a natural surface when possible. Thank you for sharing. Of course! Thank you for reading. And good luck with your rune studies! May I use your disclaimer as a basis for my disclaimer when I open up a witchy divination shop? It wouldn't be exactly the same, but I don't want to leave out anything, and I feel that you have covered all the bases quite well. I like to use a cloth that has the elemental symbols hand embroidered on it so if a Rune lands in that quarter it brings in the energy and message of that element as well. I like your plan though! Very interesting! I love it! I loved your relationship with the runes! And even more for sharing with us! May the Goddess bless you and keep you on the palms of Her hands! Thank you so much, Tinah. You as well! When you finish your casting what hand do you pick your runes up with? And do you re-cast right after you pick your runes up? Once the rune reading is over, I don't really concern myself with what hand I use to collect the runes. Once they go back into the bag, I put a small piece of quartz in there and gently shake them up. That removes anything associated with the previous reading. Hello, thank you for posting this, I found it very informative. I was wondering about a statement you made "I do not believe in merkstave or inverted runes." why is that? In modern alphabets, we don't reverse letters and give them an alternative meaning. Also, as far as to my knowledge, historically, runes weren't reversed and given alternative meanings. So I prefer to utilize the runes without the concept of merkstave.